I had a great time recently presenting at CalSpoug’s SharePoint Saturday. The first session I presented was on SharePoint Business Connectivity Service. I have done this session quite a few times and I always have at least one attendee state they have never heard of BCS before. This session was no different. One of the things I cover is the importance of BCS in different environments. Many will argue it is an old, unnecessary system. I do not necessarily disagree with this. However, I argue it isn’t dead yet. If you are working with simple data in a SQL Database or even more complex but well-organized data in a database the ease of use within BCS is quickly seen. 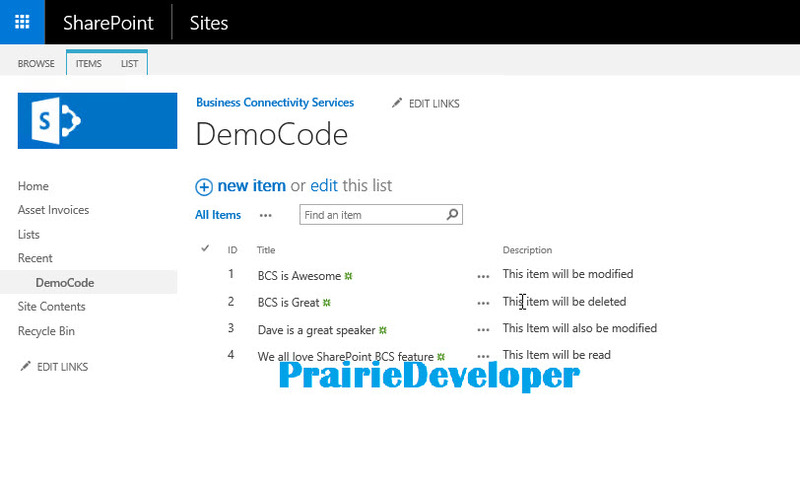 In 5-10 minutes you can connect to your data and present it within SharePoint utilizing built-in forms (no custom form development). Users will be able to read and update the data immediately (assuming permissions are configured already). There’s more to it than just this and you can take a look at my slide deck to see. Having said that, I do believe that I see an end to BCS. PowerApps and Flows make accessing data just as easy and more configurable through the many, many connectors available. As these connectors mature and the tools grow, the use cases for BCS will slowly disappear. However, we aren’t there yet. BCS is still there and still very easy to use. Take a look at my slide deck and if you have questions, please reach out. I have always been a strong supporter of the SharePoint Business Connectivity feature. I find that in many cases it allows for easy access to data you would normally have to develop custom solutions for or even pay large amounts of money in licencing for (SAP, PeopleSoft, etc). 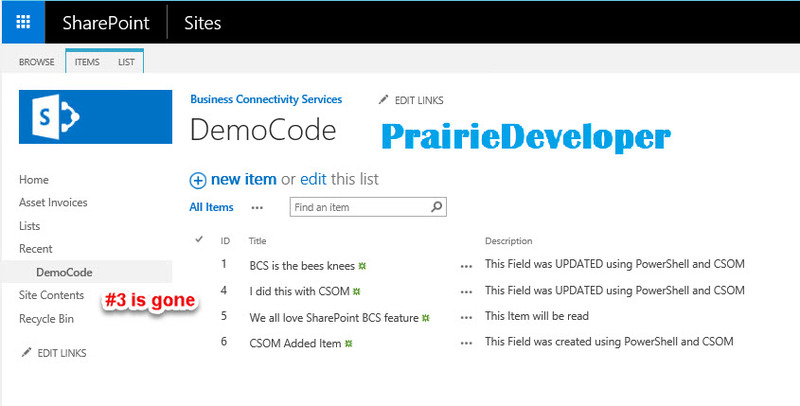 BCS brings the ability to present data located in other systems into SharePoint. A tool that many understand and use daily. In this presentation I discuss using Business Connectivity Services within SharePoint Online as opposed to on premises. You can find the slide deck here. Thanks for attending my session on this topic. Of all the methods of coding against external lists I would have to say that REST is probably the easiest. You don’t have to create any complicated CAML queries to find items to read, delete or update as you would with CSOM. You don’t have to add Service Context scope as you do with PowerShell. In fact, with REST you can actually access data using the ID of the list item. Actually, they do. However, as I said in the first post, the do not have Numerical IDs. The IDs are actual text based. Once fantastic about SharePoint REST API is you actually have a method you can call named: GetItemByStringId. This method is exactly as it sounds. Using it you will be able to get the internal ID of the list item generated when the item is added into the external list. Unlike my previous posts I am not going to show you how to access internal lists and then compare the external access. There isn’t a lot of code to write for this as I just want to give you the basics and Fiddler allows for that perfectly. 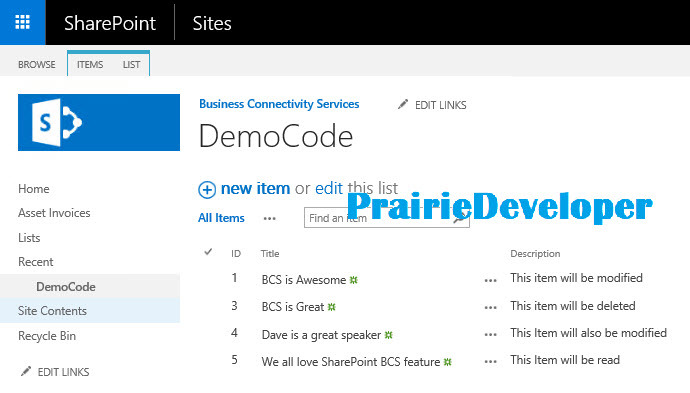 There is a great post on how to work with internal lists on the Office Dev Center. You can access that here. I decided that because I had done my previous posts using SharePoint on-prem that this time to show it doesn’t matter which environment you develop against, I am actually updating lists in my SharePoint Online tenant. Just a quick disclaimer: You will notice that all of my Fiddler screenshots contain a cookie entry in the Request Header. This is simply for accessing SharePoint Online via Fiddler. It is not required for SharePoint on-premises. Note I have included the BDC Identity column. For external lists, this is the item id. To read an item from the list we will use the endpoint: “_api/Web/Lists/getbytitle(‘<ListName>’)/GetItemByStringId(‘<item id>’)” Special note: when using the BDC Identity, ensure it starts with a double underscore. To insert data into an external list is actually exactly the same as it is for an internal list. The endpoint: “_api/web/lists/getbytitle(‘SmallAsset’)/Items” is used here. Having data in the Request Body (seen in the picture below) is what tells SharePoint to insert the data. As discussed above, getting an item from an external list is a bit different. With external lists you have to use GetByStringID instead of simply placing the item id after the indicating you are accessing items from a list in the REST call. The call to the endpoint is similar to: “_api/Web/Lists/getbytitle(‘<List Title>’)/GetItemByStringId(‘<BDC Identity>’)“. In the following I want to update AssetID#3 and set the location to Regina and the Details to “Updated with Rest”. You can see that the list item updated successfully. Deleting a list item is very similar to updating an existing item. You simply need to change the http method to “DELETE” and remove the request body. The call to the endpoint will be the same as the Update one in fact (“_api/Web/Lists/getbytitle(‘<List Title>’)/GetItemByStringId(‘<BDC Identity>’)“). You can see in following screenshots that I deleted the entry that indicated it was added by Fiddler (AssetID: #9). That’s the basics of working with External Lists and REST APIs. As you can see it’s really easy. Each of the methods I illustrated today could be moved to on-prem SharePoint simply by changing the URL and nothing else. I created my blog series on SharePoint BCS quite some time ago in order to illustrate how easy it is to access data outside of SharePoint and present it within a list or document library. I have been meaning for quite some time to demonstrate how writing code for external lists\libraries is very similar to writing code for internal lists\libraries. Today I am going to start a new three part series on SharePoint BCS development by showing you how you can enhance your solutions using PowerShell to access data in external lists. The posts aren’t going to be too in-depth, but meant to get you started. I hope to build on them later and post a series on creating an entire solution around BCS. With SharePoint PowerShell you are basically using the server object model for development. So this means you have access to the methods and processes utilised by this system. What you’ll notice is that code to perform inserts, updates, reads and deletions is pretty much exactly the same. Where the code differs between internal and external is actually around accessing the item to be updated, read or deleted. Notice in the code above that we are using a pipe to gather the data. One thing to note with External Lists is they do not have a numerical ID field. However, in this case we are grabbing the ID field of the Asset so we can search on the AssetID of the item. That’s the basics of updating an External List with PowerShell. In the next post I will cover updating using CSOM.